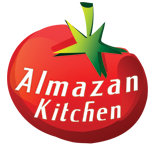 Hi and welcome to the Almazan Kitchen! Such a great weather outside. Today, Almazan Kitchen and Mr. Ramsay The Owl prepared something very special for you! Mr. Ramsay is in love with meat, what can we do? It will be a chicken today! With a creamy mushroom sauce, under tasty spices! Slice 300g fresh boletus mushrooms. Take your cutting board, add 1/2 tsp. sea salt, 1/2 tsp. gound chili and 2 tbsp. khemli suneli spice mix. Roll 400g chicken breast on the spices, until chicken is all covered with it. Place the pan on the fire, add some oil. Put the chicken breasts into the pan. Add 3 garlic cloves, cook for 7-8 min, don’t forget to flip. Add mushrooms into the pan. Add 1 tbsp. šljivovica (brandy). Flip & toss carefully, cook few minutes more. Take wooden bowl, add 1 tbsp. corn starch, add some water, mix it. Add step 10 into the pan. Transfer chicken to the cutting board and slice it, add mushroom sauce above.